Tony Pullis is the outspoken, straight talking manager of Stoke City in the Premier League and recently he has had plenty to say about referees. Stoke’s players have picked up more cautions than any other team in the league so far this season and of course he puts the blame firmly on the referees. He has taken his complaints to Mike Riley, who is now head of the Premier League referees. 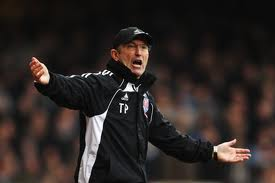 ‘I have given him a piece of my mind,’ Pullis is reported to have said, ‘I find the whole situation very disappointing, week after week.’ My own experience of Stoke this season is purely from the television but I am not surprised at the large level of yellow cards. I’m sure that even Pullis would admit that he certainly does employ some tough tacklers. At a relatively small club with limited resources, he may argue that this how he has managed to keep Stoke in the highly competitive Premier League for the last six years. I’ve heard on our local radio recently, from supporters and even commentators, that they would like to see more fouls from Reading. I suppose it is thought that it shows more commitment, more fighting spirit. If you don’t have the talent to match your more illustrious opponents then rough them up a little. What we have to realise of course is that Tony Pullis is trying a little of the psychology that Sir Alex Ferguson is so adept at. Prior to the United – City derby game recently, Sir Alex claimed that referees awarded more penalties to City than they did to United. As it was there was only one penalty award difference between the two teams this season. What they are trying to do by their claims that their teams are being treated unfairly, is to put pressure on future referees to influence their decision making when faced with similar incidents. Pullis may have had a case with the dismissal of Ryan Shotton, when although he brought down Fabien Death in the game against Aston Villa he appeared to be trying to avoid him. The problem for referees is that players often deliberately run close behind their opponents and without actually making a tackle still bring them down. It looks like an accident, which is what they claim but they know exactly what they are doing. In Shotton’s case he was already on one yellow card so another also meant red. This highlights a situation that I get asked about. Players are often cautioned for what appears to be an innocuous foul and if they have already been cautioned it means they are sent off. It is not a reckless tackle that is done in a manner without thought of the consequences to the opponent and at most times it would only result in the referee awarding a free kick and nothing more. So what turns it into a yellow card? This happens when the referee considers it to be what’s known as a tactical foul. Guidance to referees in the Laws of the Game says a player must be cautioned and shown the yellow card if he guilty of unsporting behaviour, by committing a foul for the tactical purpose of interfering with or breaking up a promising attack. This could be when a player trips an opponent as he is running down the wing where he could get into a position to cross the ball into the goalmouth. It could also be something as simple as holding on to a player’s shirt to prevent him reaching a pass which could put him in a threatening position. I think that when referees are faced with a decision to make, they have enough to think about, without having pressure put on them by managers paying psychological games.